One night they came... The darkness grew colder, deeper, darker, and swallowed up everything... Marwan is a young boy on a journey he never intended to take, bound for a place he doesn’t know. On his journey, he relies on courage and memories of his faraway homeland to buoy him. With him are hundreds and thousands of other human beings, crossing the deserts and the seas, fleeing war and hunger in search of safety. He must take one step after another—bringing whatever he can carry, holding on to dreams. This is the journey of one boy who longs for a home, and we follow his path, walking hand in hand with him as he looks forward with uncertainty and hopes for a peaceful future. This beautiful, heartfelt story gives a human face to the plight of refugees all over the world. 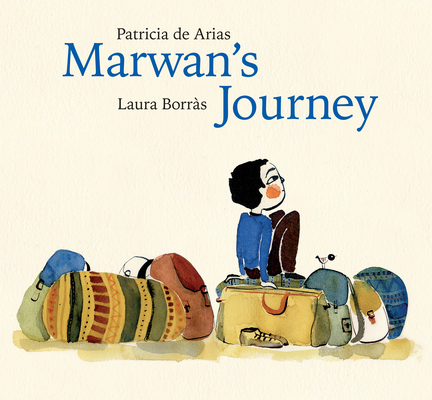 Marwan’s journey is everyone’s journey. Patricia de Arias was born in Spain in 1973. She began her career as an actress before publishing a number of children’s books in Brazil, where she now lives. Her work has received international recognition, including Marwan’s Journey, which received a Special Mention at the Bologna Ragazzi Awards in Italy in 2017. Laura Borràs is an internationally acclaimed illustrator who has published numerous books that have been awarded in many countries. She studied illustration in Spain and Italy, and her work has been recognized by the Bologna Children’s Book Fair.